Printing high-quality, professionally finished CDs, DVDs, and Blu-ray Discs is fast, affordable, and radically simple with the Microboards G4 Autoprinter. The printing process is easy, with a radically intuitive interface that anyone can operate; and its 50-disc capacity enables unattended printing. Simply set it up, walk away, and get on with business while the G4 Autoprinter does the rest of the work for you. Utilizing our disc handling technology—for a smoother, cleaner image—and proven HP inkjet technology you’ll enjoy great-looking results. In fact, your discs shine bright and make the desired impact with brilliant color—in text and graphics—disc after disc after disc. Churches, schools, sales and marketing departments, government offices, videographers, and recording studios alike will benefit from the ease, speed, affordability, and professional results derived from the Microboards G4 Auto Printer. You are certain to make a positive impression with finished CDs, DVDs, and Blu-ray Discs that look amazing, thanks to HP inkjet technology and the vibrant colors derived from HP inks. When you use the G4 Auto Printer, the process of producing professionally finished discs—in mid-to-high volumes—is nearly effortless. Anyone—even novice users—can easily operate the printer, thanks to a radically intuitive user interface and labeling software, designed specifically for the Microboards product line. 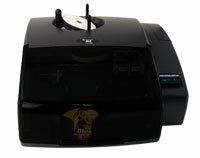 Set it up and walk away—the 50-disc capacity enables automatic unattended printing of all your discs without hiccup. The industrial G4 Auto Printer is your answer to printing discs quickly and cost-effectively—delivering discs with both text and graphics in less than 20 seconds and for only 25¢ per disc. SureThing label design software enables you to create labels with a professional flair. And whether you’re printing full-color, full-coverage discs or light coverage with text only, you’ll enjoy results of the highest quality. Our 4th generation disc handling technology provides smooth, clean images; and HP inkjet technology provides consistently brilliant color—in text and images—on each and every disc. Take your efforts to the next level with the latest Microboards innovation, and our service and support technicians who are always available—if or when you need them. SureThing Label DesignerDesign disc labels by adding backgrounds, pictures, and text. Print directly from SureThing or use with PrintWrite for full publishing needs. Comes standard with all disc publishers and disc printers. Disc Label from Smile SoftwareLike SureThing for the PC, Disc Label is the Mac label design software that comes standard with all Microboards disc publishers and disc printers.